Designs are getting more compact. Have you noticed that? As 70 percent of the world's population is projected to be living in metropolitan areas by 2050, it's just assumed that space will be tight. 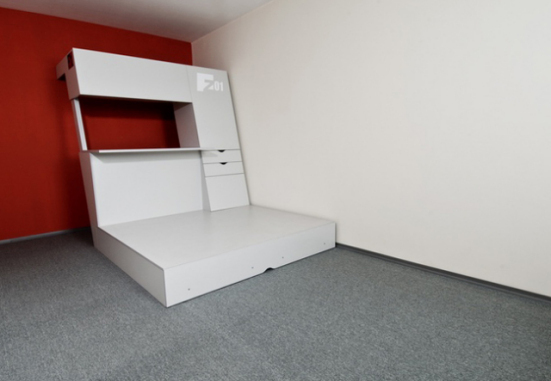 I believe that Russian architect and designer Vladimir Yuzbashev has beat the pack so far by designing nearly a full apartment into less than 200 square feet. I say nearly a full apartment, but honestly if you lived in a small efficiency (one-room), all you would need is a bathroom, a kitchenette, and a Form_Z01, and you would still have plenty of room. 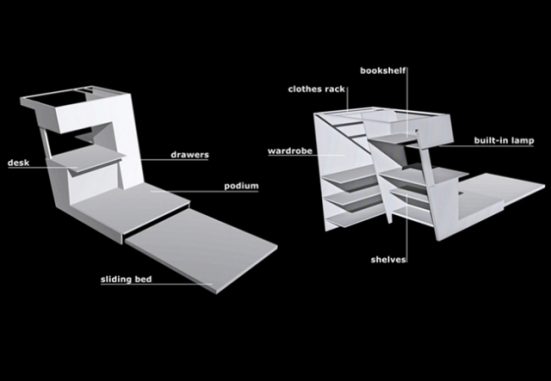 Yuzbashev's Form_Z01, which won a RedDot Design Award in 2009, is the epitome of living with less in less space. This multi-purpose living module is a combination office, bedroom, party space, and front hall closet. It even has a 'chill out' space. 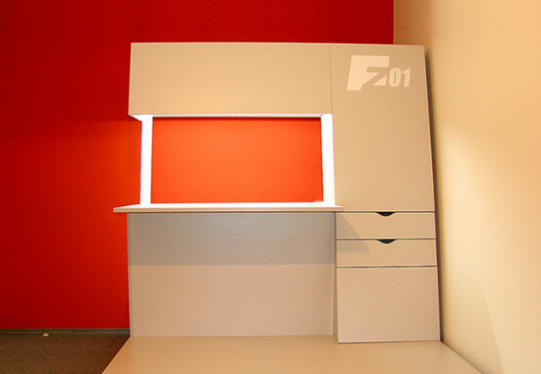 Form_Z01 by Vladimir Yuzbashev - Closet with shelves and a rack for hanging clothes, all located between the wall and the office area. Beautiful design... no? I love the way the vertical portion is slanted backward to leave space to get behind the form_Z01. Oh, and the chill-out space is the horizontal platform, under which the bed lies. A few large throw pillows and you've got a living room too! For function, the Z01 sure beats the old Murphy Bed. BMW Helps You Be a Gentleman with New "Gentleman Function"
Moon Mined for Earth’s Alternative Fuel? Separate usages cool, but together? The separate uses are pretty cool, but a few issues exist. What happens to the "party bar" feature when I am using all of the closet space? Or where do I put my office supplies when I need a desk?